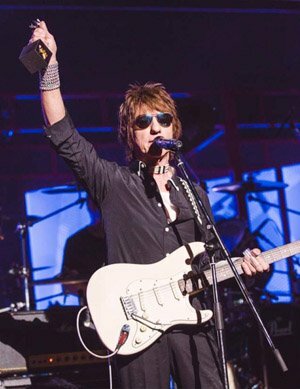 On Friday 11th November, Jeff Beck took centre stage at the Classic Rock Roll of Honour. In recognition of his ground-breaking career, Classic Rock magazine readers voted for Beck to receive the evening's highest accolade, The Icon award. Friends since childhood, fellow guitar legend Jimmy Page was on hand for the presentation. This year's ceremony was held in Japan for the first time ever, at the Ryoku Kokugikan Stadium in Tokyo, where copies of Jeff's new career-charting Genesis book were on display. To secure your copy of Jeff's signed limited edition, visit www.JeffBeckBook.com. Reader Offer: Celebrating Beck's Classic Rock Icon Award, BECK01 now also includes: a signed book plate from BookMarc, Tokyo; a 12-inch copy of Jeff Beck's new album Loud Hailer; entry into the reader prize draw to win a signature model Stratocaster. Offer ends January 2017.